‘Inspiring boxes of crayons since 1497’ is the tagline of the tourist board, and there was never a truer words said about travel to Newfoundland. And if it were a colouring book it would reveal rows of brightly painted houses and lush landscapes of blues and greens. Resting off the east coast of Canada, Newfoundland offers its own unique signature range of experiences, which has been tempting and delighting visitors for years. With Viking heritage to discover, cruises to spot whales and icebergs, and clifftop views to make you feel like you are on top of the world, the natural beauty and the great outdoors doesn’t come much more awe-inspiring than here. Create your own authentic island adventure as we reveal the best ways to travel to Newfoundland, and the most enchanting things to see while you are there. 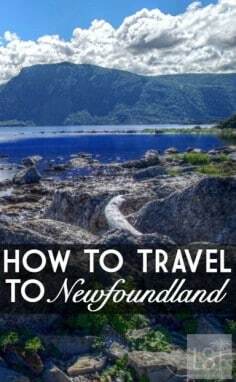 Newfoundland has a long and colourful history, with most attractions having some form of legendary tale attached to it. The youngest province of Canada, it is considered one of the fastest growing with booming industry. 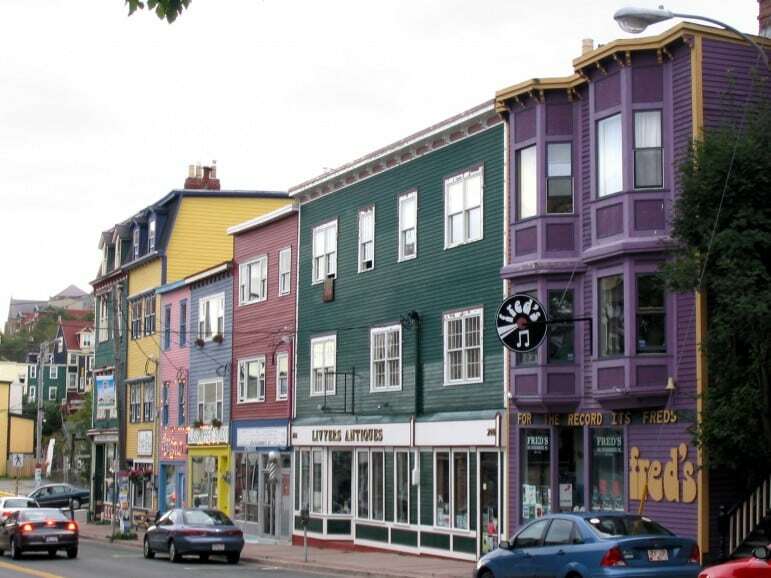 The capital, St John’s overflows with a vibrant cultural scene, attracting musicians, artists, writers and dancers from Canada and across the globe. But many are drawn to the east side for its natural beauty and outdoor pursuits, starting with whale watching. Newfoundland sees the largest population of humpback whales, and the best time to visit is late spring to early summer during their migration season. Book a boat tour to see these magnificent creatures. 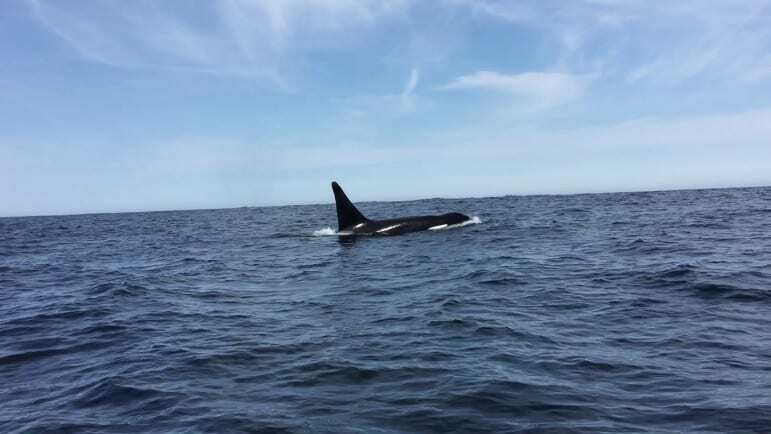 As very inquisitive creatures, it’s not unusual for a whale to get close to one of the visiting boats, swimming gracefully around the vessel. You can also view travelling pods from land, while enjoying hikes along the coast. Nurture the soul and venture around the island on foot to truly experience sights and sounds within the rugged landscape. Spot moose, bird life and freshly calved icebergs, as you wander one of the numerous trails. The East Coast Trail offers a seaside walk through 30 coastal communities, each with its own landscape, history, and surprises. 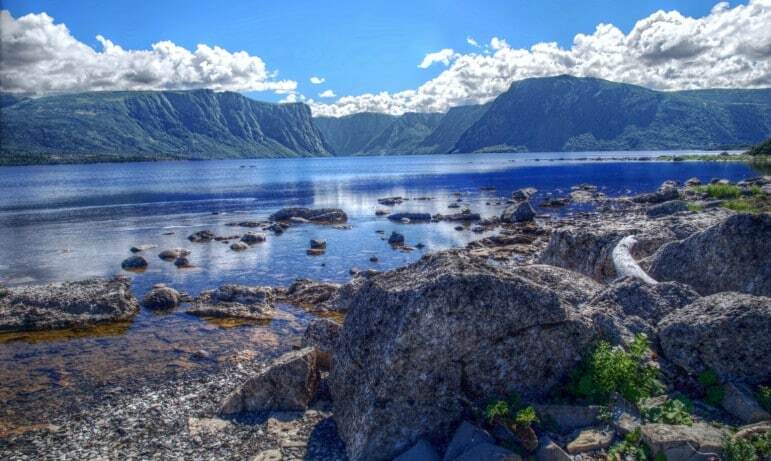 If you’re a keen hiker, visit Gros Morne National Park in late May for the Trails, Tales and Tunes Festival, combining dramatic views with art exhibits, concerts and child friendly activities staged around the waterfront. 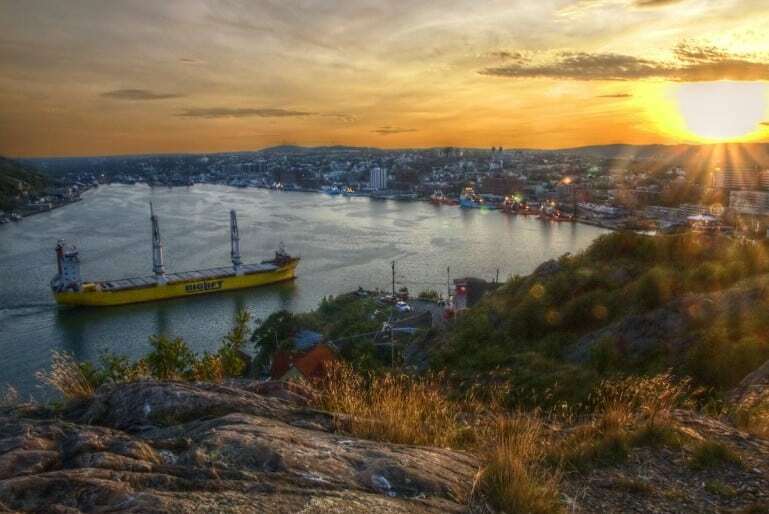 With Canada’s highest concentration of creative professionals per capita, you won’t have to venture far for an event in Newfoundland’s capital, St Johns. During the summer expect an endless supply of live music and theatre events to entertain and delight. Further owing to its cultural influences, time spent around the town’s colourful streets throws up curious shops with pottery, jewellery and wooden crafts worthy of an afternoon’s window shopping. Meanwhile foodies are catered for with local shops selling jams and traditional foods; while its restaurants celebrate the island’s many delicacies. As it’s on the Atlantic Ocean, naturally seafood is a regular feature on Newfoundland menus. Mouthwatering cod, lobster and shellfish will tempt hungry seafood lovers. History buffs can explore the island’s Viking roots through food with a trip to famous site L’Anse aux Meadows in the north for the Great Viking Feast. 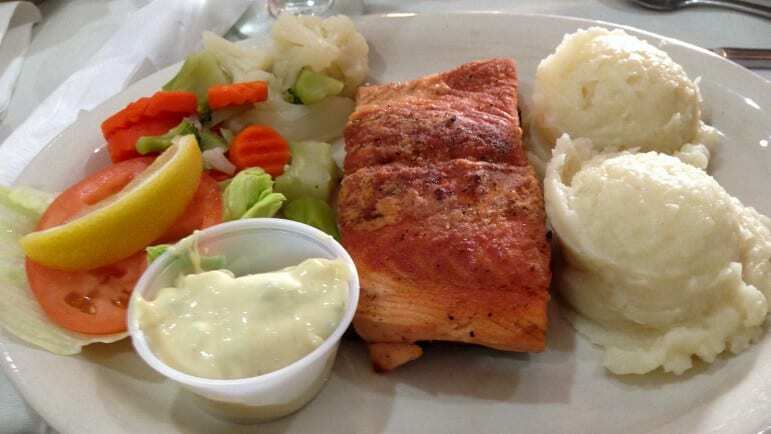 Dine in a sod hut on mosse stew, salmon, cod cheeks and roast capelin. Ever tasted water or beer made from iceberg water? Make it happen at Quidi Vidi Brewing Company which harvests iceberg ice to brew crisp, clean lagers. If you have something of a sweet tooth, Newfoundland Chocolate Company in downtown St John’s might just please your taste buds. Pick up some of the finest artisan chocolates in the store, or indulge in a velvety hot chocolate in the onsite café. Go a step further and discover how it’s made at their boutique chocolaterie. 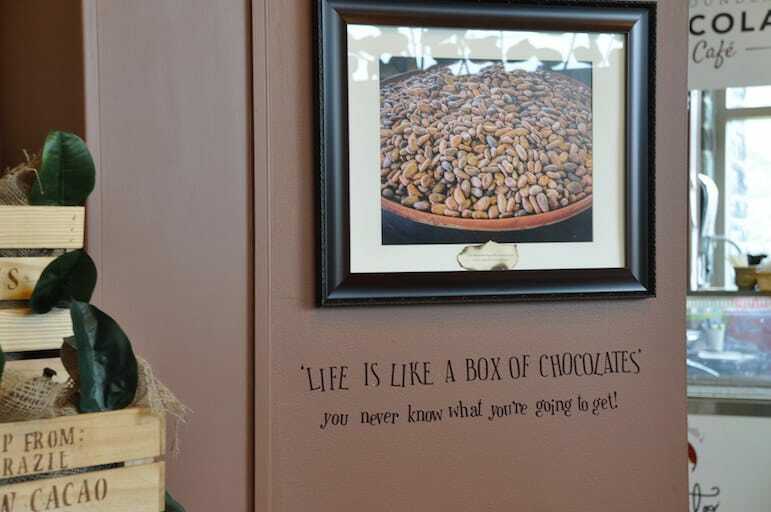 Filled with the rich aromas of chocolate and the finest cocoa blend literally dripping from the ceiling, it is a haven for lovers of the sweet bean creations. 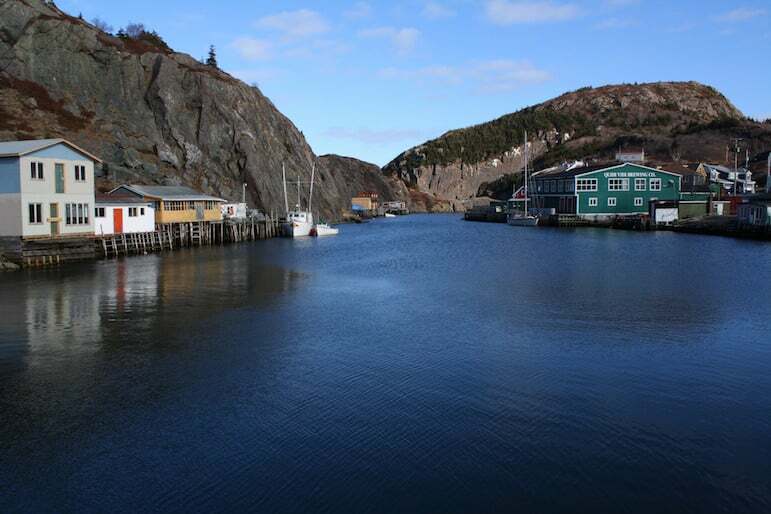 Escape the city for a real taste of Newfoundland culture and head to Twillingate. This pretty island is brimming with regional character, from iceberg sailing trips to hikes, and great restaurants serving up Newfoundland’s favourite seafood and fish dishes – from lobster to cod tongues. From colourful bed and breakfasts to sleek boutique stays, Newfoundland has accommodation to suit every travel whim. 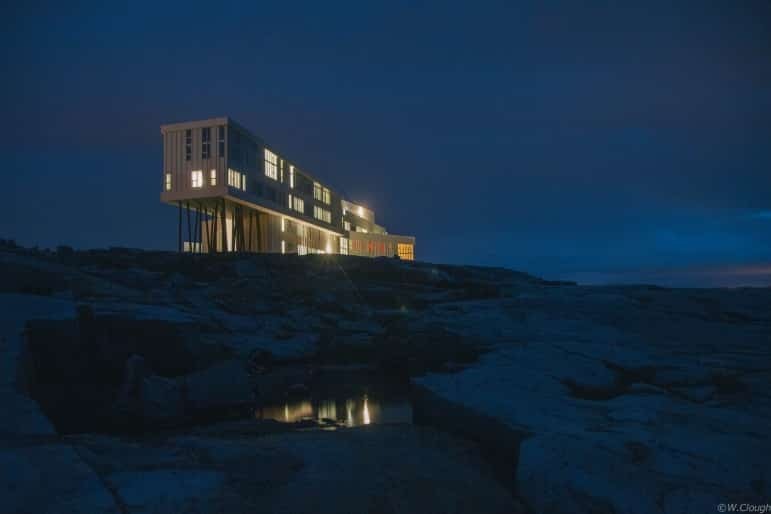 Fogo Island Inn is an exclusive island hideaway. An impressive feat of architecture, the mesmerising sea views offer some peace and serenity. Contemporary, yet altogether traditional, the inn sits on stilts over the coastline with floor to ceiling views of the ocean. Meanwhile the sauna, hot tub, cinema and reading room provide some very good reasons to spend a day chilling out around the hotel. The Luxus Boutique Hotel & Lounge is a more recent addition to St John’s, offering modern touches with cutting edge technology and friendly hospitality. With no check-in desks, you are escorted directly to your room and checked in en route, and you can also peruse the pillow menu for the perfect night’s sleep. Paradise B&B in Twillingate has one of the most astounding Atlantic Ocean views and is run by a lovely couple making your stay a homely, real taste of Newfoundland life. Air Canada is the leading airline offering flights to Newfoundland, from approximately £450 per person, with a flight time of six hours non-stop from London. 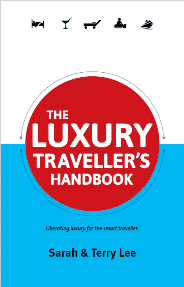 British tourists need an electronic travel authorisation visa to visit Canada. Some images here are licensed under Creative Commons 2.0: Emmanuel Milou, The Tedster, Shankar. S, Wyatt Clough, and Creative Commons 3.0: Aconcagua.